It is the early 1900s in rural Kentucky and young Saul Sullivan is heading up to Redbud Camp to look for work. He is wary but unafraid of the Cherokee girl there whose beauty is said to cause the death of all men who see her. But the minute Saul lays eyes on Vine, he knows she is meant to be his wife. Vine's mother disapproves of the mixed marriage; Saul's mother, Esme, has always been ill at ease around the Cherokee people. But once Vine walks into God's Creek, Saul's mother and his brother Aaron take to her immediately. It quickly becomes clear to Vine, though, that Aaron is obsessed with her. And when Saul leaves God's Creek for a year to work in another county, the wife he leaves behind will never be the same again. the violence that lies ahead for Vine will not only test her ability to forgive - both others and herself. One of the big advantages of being part of a book club is that you often find yourselves being encouraged to read books that you just normally wouldn't read. This is especially true if that particular book club has quite eclectic tastes. This year alone we have read Fifty Shades of Grey the book that shall not be named, To Kill a Mockingbird, and then this book among others. A Parchment of Leaves is a book that I hadn't heard of before, or even the author! It is historical fiction, but it is firmly set in a particular time and place - the mountains of Kentucky during the early 1900s - one which I haven't read much about at all. Whilst the events in the larger world do have an impact on the lives of the people, they are also relatively self contained within their area. One reason why I found this era so interesting to read about it is that it seems kind of in between, especially in terms of technology. For example, whilst there were some cars and trucks, for most people this was beyond reach and so they still either walked or rode their horses and most chores around the house were still very labour intensive. The book opens with young Saul Sullivan braving the rumours about a Cherokee girl who is so beautiful that men die when they see her and heads to her home, looking for work. He has his younger brother Aaron with him. Whilst he doesn't die as soon as he see Vine, he is slayed emotionally and he knows that she just has to be his wife. This is reiterated when his younger brother is bitten by a snake and Vine and her family save Aaron's life. Vine too is mesmerised by Saul and it isn't long before they are married, despite the opposition of their families who are concerned about their mixed marriage. Together Vine and Saul build a house, build a life together, with Vine overcoming his mother's opposition and soon becomes close to Esme. Really, the only thing that isn't quite right is Aaron's obsession with Vine, to the point that he runs off and bring himself home a wife - one with more than a little in common with Vine looks wise. With World War I raging in Europe, Saul goes off to log trees on another mountain which in turn will be turned into turpentine and shipped off to the battlefields knowing that the money that he earns will help set his family up for years to come. While Saul has his eyes on the future, in the here and now Vine is left to run the home, help Esme and Aaron's wife. Most worryingly the only man around the house is Aaron. The implications of Saul going away will be felt by everyone on that mountain for quite some time. Whilst at it's heart this novel is about Saul and Vine, it is also about secrets, about race issues and the loss of the Native American identity (when families try so hard to assimilate into the surrounding community), about trust and forgiveness and so much more. As for the characters, Saul was the strong, silent type. Vine knew that he loved her, but it was really in his letters that he was the most eloquent and able to tell his wife how much he appreciated and loved her. Vine was an engaging character - strong, resilient, resourceful and proud. She was a woman who found herself in a very difficult situation. Whilst it would be easy to sit and judge and say that she did the wrong thing, it would also have been very difficult for her to take another path, particularly at that time in history and in that place. 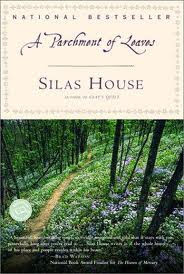 I mentioned before that this is a novel firmly placed in the Kentucky mountains, and this was clear from not only the use of the mountains as the setting, but also in the dialect that the characters used. It took a little while to get used to it, but there was a certain charm to it nonetheless. There was an early snow the day we found out the war ended. Just a light dusting that didn't amount to anything, but it seemed like a sign. The sky was a bright gray, and the sun showed itself like a silver ball hung there, so smudged you could look right into it. The snow drifted down and frosted the big rocks lining the creek, clung to thin tree branches. It stood like sugar in the yard. By noon it had melted away except where the sun could not reach; it striped the mountainside like white rows in a garden. The road turned to mud, and the yard was too wet to walk through. Even after it melted, the scent of winter had come in, solid and tough, letting us know what it had in store for us. We learned of the war's end from some boys over on Buffalo Mountain. They'd heard the news in town, got drunk, and come back through, firing their pistols up into the air. America Spurlock lived out at the mouth of God's Creek, and she could hear them coming from a long ways off. She always was nosy. She got her shotgun, went out to the edge of the road, and waited for them. They bowed their horses up when they seen her there. They took their hats off and started telling about the war ending as fast as they could, each of them taking a turn in sharing the news. And of course she run up the holler, squalling for everyone to come out and hear the news. She had a a grandson over there and she was wild with the prospect of him coming home. She was so excited that she paid no attention to the shining mud that caked her shoes and lined the hem of her skirt. I am glad that I stepped outside my comfort zone just a little bit to be able to read this one! Adapted from a review originally posted at The Adventures of an Intrepid Reader.